1 Sae Haruta, 2019 Miss SAKE Japan, participated in the Sixth Fukushima Sake Festival at Marunouti building. Sae Haruta, 2019 Miss SAKE Japan, participated in the Sixth Fukushima Sake Festival at Marunouti building. Good evening, everyone. I am Sae Haruta, 2019 Miss SAKE Japan. On April 11th, I participated in the Sixth Fukushima Sake Festival at Marunouti building. 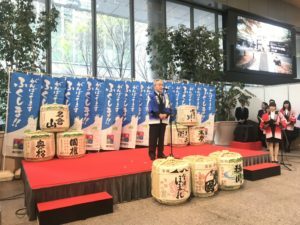 『Fukushima Sake Festival』took place to promote the sake made in Fukushima prefecture and it has been held annually since 2014 and this was the sixth time to be held. At the festival, there were Mr.Seishi Kitamura, who is the president of Toho bank, Mr.Masao Uchibori, who is the governor of Fukushima prefecture, Mr.Yoshihiro Ariga, who is the chief director of Fukushima sake maker association and Mr.Keiji Kimura, who is the special adviser of MITSUBISHI ESTATE CO., LTD.
Firstly, Mr.Kitamura, who is the sponsor of this festival, gave opening address. 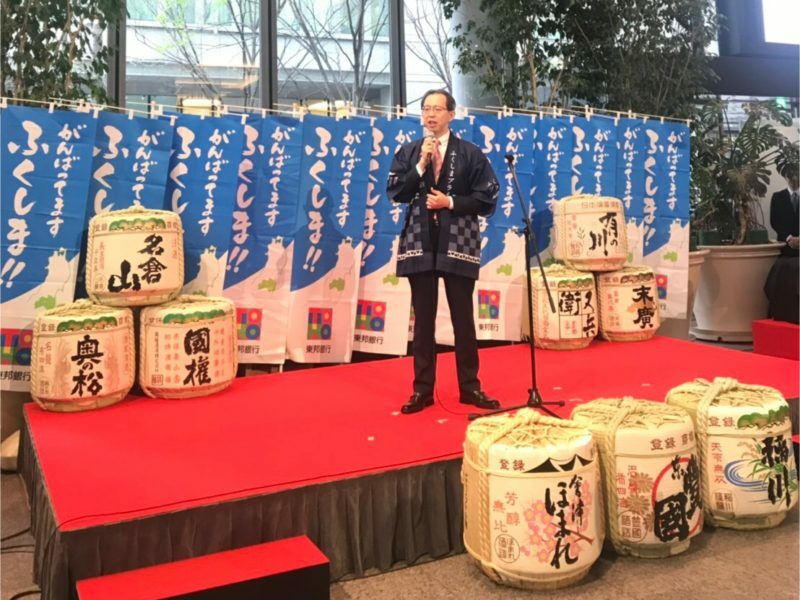 After that, I joined the sake barrel opening called kagami-biraki with them and gave a speech on the stage. 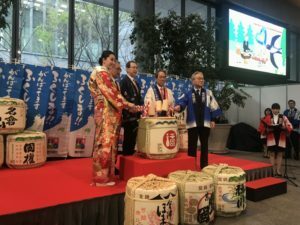 Fukushima prefecture has received the gold prize at National New Sake Appraising and Deliberating Fair for the sixth year in succession, so people there have particularly gotten lively about such a splendid achievement. Fukushima prefecture is rice-producing region and many kinds of rice suitable for brewing sake are produced there. Sake brewers in Fukushima prefecture brew many tasteful sakes with the rice. Sake making in Fukushima prefecture has history as long as four hundred years since Mr.Masayuki Hoshina, who was the founder of what became the Matsudaira house of Aizu, called a chief brewer at a sake brewery from Omi and made him brew sake. Sakes made in Fukushima prefecture, which has such a long history and achieved the satisfactory result, attracted many people at the festival. At the venue, the premium local sake set was served, so that people could enjoy the local sake by comparing the taste of different brands, and also some locally made snacks were served to everyone there. Many people had a good time with sake made in Fukushima prefecture. While talking with the visitors, I could have a significant time because I realized sake brings new encounters and makes a moment of bliss for everyone. Thank you very much for the great experience, Mr.Seishi Kitamura, who is the president of Toho bank, all members of Toho bank and everyone who have worked for the festival.